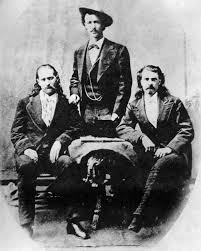 There were many famous scouts, but few more famous than "Wild Bill" Hickok and "Buffalo Bill" Cody. Here's a picture of Hickok (l) and Cody (r) and standing behind him is their co-star in the show Scouts of the Plains. Who is this plainsman? Click here to post your answer.